Keep Your Eyes Out For Termites! 02 Mar Keep Your Eyes Out For Termites! As the warmer weather approaches, you may encounter a “swarm” of insects inside or outside of your home. Both ants and termites will produce reproductives with wings to ensure the survival of the colony. The act of swarming usually means the colony has been active for 2 or more years. Homeowners should be vigilant in making their homes less attractive to these wood-hungry pests. An important method for preventing carpenter ant and termite problems is to eliminate high moisture conditions that are attractive to them. Also, replace any moisture-damaged wood and never have wood-to-soil contact. Be careful that wood or lumber that is stored in a garage or near the house is kept dry and, if possible, elevated to allow air circulation. Store firewood as far away from buildings as possible. Remove tree and shrub stumps and roots so they don’t provide a food source. 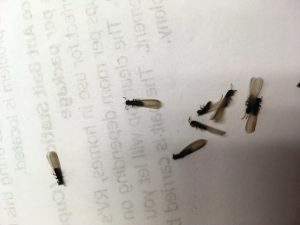 If you find these insects close to the home or inside, call us! 1-800-649-9992.